“Buttery rich, nutty flavor” are the superlatives we hear most often when people describe why they love KAMUT® brand khorasan wheat products. This ancient grain has a wide variety of uses. It’s great in baked goods, breakfast cereals and pasta. We sell KAMUT® as a whole grain, whole grain flour and white flour. Just use KAMUT® flour in place of, or mixed with, wheat flour in your favorite recipe to add flavor, color and nutrients. Sprouters tell us the flavor of juice from KAMUT® wheat grass is much sweeter than ordinary wheat. KAMUT® wheat is higher in protein than ordinary wheat and has more essential lipids and amino acids. Every kernel of KAMUT® brand khorasan wheat is certified organic. We contract with family farmers to grow organically certified KAMUT® wheat mostly in Montana because this environment most nearly duplicates its ancestral environment in Egypt. Because KAMUT® wheat has never been hybridized with any modern wheat varieties it is ideally suited for organic production. Test plots show it responds best to natural fertilizer like “green manure” (legumes that take nitrogen from the air and put them into the soil) rather than commercial – natural gas manufactured – nitrogen fertilizer. Of course, KAMUT® wheat has never had its genetic makeup altered artificially so it is always free of genetically modified organisms (GMOs also called genetically engineered, GE). We’ve never even tried to improve the grain through “natural” plant breeding techniques. KAMUT® wheat comes naturally to you as nature intended it. KAMUT International Ltd. has licensed Montana Flour & Grains as the exclusive U.S. contractor for growing of KAMUT® wheat. 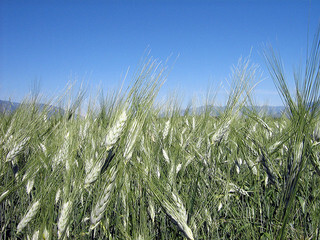 “Khorasan” is the wheat variety (family) of KAMUT® wheat. We sell Khorasan wheat that meets our rigorous quality guidelines under the brand name “KAMUT®.” See kamut.com “Why we have a trademark” for further information. You may also read nutritional analysis and a comparison between KAMUT® wheat and ordinary wheat on the official KAMUT® site. To order whole grain, whole grain flour or white flour, please click on “Store” link from our home page. You may also click "Bulk Orders" for information on larger volume orders. As well, a list of products and the great companies that make them is available on kamut.com. Most products are available at supermarkets or health food stores.